Six graffiti artists are sitting at a café on Bostan Street in downtown Cairo just after sunset. It’s a mixed bunch, men and women ranging from 17 to 30 years old, quite a few from Alexandria, one from Fayoum — the Cairo kids are late. They wait nonchalantly, drinking tea and stretching back into the green plastic chairs that line the street, hands and clothes splattered with paint. Cairo-based artist Sad Panda strolls up in his slouchy way, warmly greeting his colleagues with witty hellos. He did some pieces in last year’s Women on Walls (WOW) event, but is not yet officially a part of this year’s version. “Are you gonna draw with us or what?” one woman asks, nodding her head toward the garage across the street. He walks off, presumably in search of cigarettes. The “night shift” artists continue to wait as the clock eats away the week-long graffiti project. WOW is a Danish-funded project with various Swedish participants that aims to direct the unique creativity of Egypt’s street artists toward a national campaign focusing on women’s empowerment. 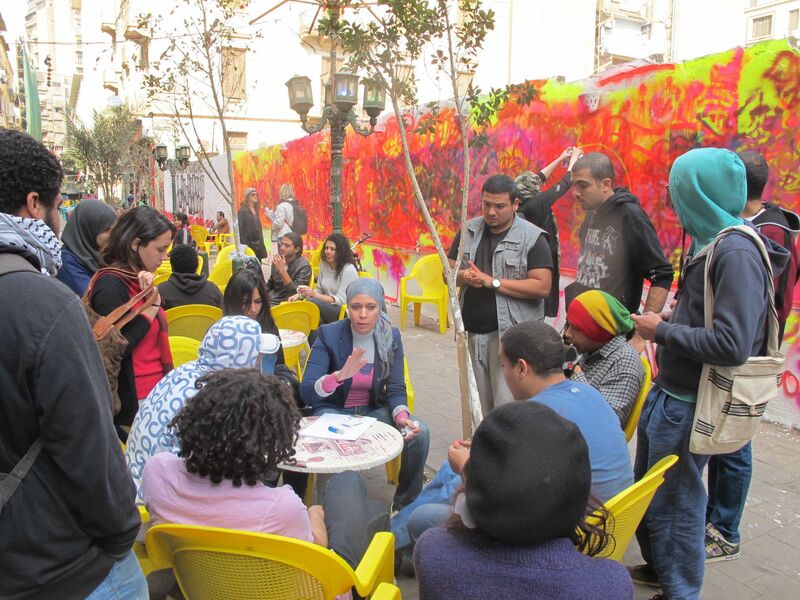 In spring 2013, nearly 40 artists participated in the project to create street art in Mansoura, Alexandria, Cairo and Luxor. I thought it was a successful exercise in group building for the graffiti community, but remained on the fence about mobilizing graffiti artists for socio-political campaigns, no matter how urgent the issue. On the one hand, steering artists away from their typical individual work processes can stimulate important collaborative work — with few exceptions, like the Mona Lisa Brigade, most local graffiti artists fly solo. But on the other, campaign-driven art can often be contrived, reducing the power of free expression that defines graffiti. Now in its second edition, WOW has gathered another batch of artists, 11 women and four men. Because it’s volunteer-based, artists were still signing up throughout the week, while some who had signed up weren’t able to participate in the end due to work commitments. The Mona Lisa Brigade, which was part of last year’s program, also contributed this year. WOW co-director Angie Balata says an open call was placed on Beit El Raseef’s Facebook page, and last year’s artists were asked to recommend new participants to volunteer. They were encouraged to join only if they felt inspired to work in the theme of “women in public space,” although they were left to openly interpret this in the images produced. This year, WOW is taking place only in Cairo due to limited funding. The Danish CKU grant that funds the project has been used pay the administrators, provide food, transport and supplies for participants, and market the program. The artists are currently transforming the wall of a parking lot/café on downtown’s Sherif Street, and the interior of a garage on Bostan Street. They volunteer in two shifts depending on availability: The day shift works on the street, while the night shift take to the garage after finishing their day jobs. Both walls are privately owned — Balata says the garage and café owners seemed eager to donate them. The murals will be there as long as they choose to keep them. The project started on February 8 and runs through February 14. As well as wall sessions, it has involved workshops for the artists and a seminar at Vent led by Swedish journalist and Middle East correspondent Cecilia Udden and a panel including Carolina Falkholt, a feminist graffiti artist from Sweden, and local artists Radwa Fouda, Lamis Soleiman and Ismail Shawky. They discussed women in public space, and why street art can be a good tool to discuss the topic. It was a great crash course on the work of women’s rights organizations, engaging the artists in both general discourses around the issues and exposing them to specific awareness campaigns. The artists were then left to brainstorm together about if and how they could translate these ideas to the walls. They were not told to paint anything in particular, but rather encouraged to work together to integrate women into public space through their individual and collective decisions to use art for activism. I sit with Balata for tea in the garage while the artists discuss methods, wall wars and technique. 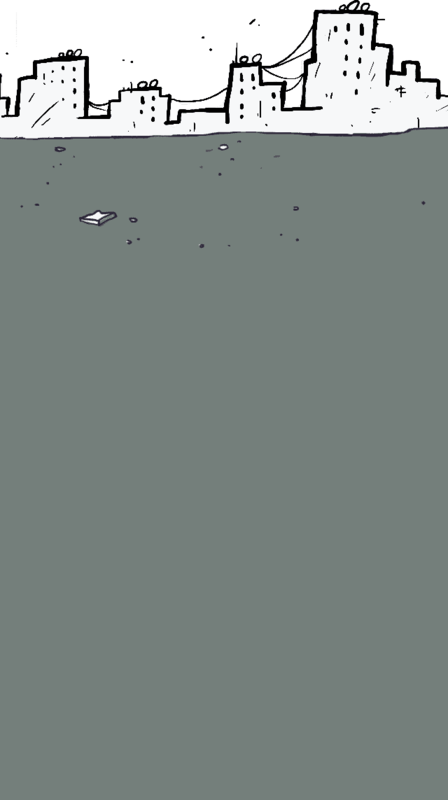 Just as all the artists arrive, the electricity cuts and everyone is left waiting and plotting until their sight returns. Balata simultaneously fields questions left and right from the artists. “Why don’t we just get some projectors and a generator?” one suggests. “Why don’t we at least start measuring the walls and discuss our ideas more?” says another. In the end, the garage artists began work the next day, and will conclude the resulting collective mural by February 15. “So we couldn’t make it outside of Cairo this year, but we added some substantiating factors by means of partnering with organizations like Nazra and HarassMap in order to dig deeper into women’s rights issues and female empowerment,” Balata says. Nazra aims to build an Egyptian feminist movement, while HarassMap uses a virtual mapping system to track sexual harassment on Egypt’s streets, as victims report attacks by SMS or online. At the beginning of the week, WOW held a workshop hosted by Nazra, where several women’s issues were presented to the artists, most of whom attended. The session was run by Farah Barqawi, co-founder of The Uprising of Women in the Arab World, an “intifada” seeking to create a free, secular space for constructive dialogue and women’s rights campaigning. Barqawi discussed the laws that discriminate against women in Egypt, then Ghadeer Ahmed, co-founder of Girls Revolution (@GirlsRevolution), which organizes mixed gender bike rides in Cairo to break gender stereotypes, gave a presentation. HarassMap’s communications managers then presented their work. “Sexual harassment is one of the major issues that the artists identified as having negative effect on everyone in Egypt,” HarrassMap’s Noor Flinkman tells me. HarassMap is also planning to send out volunteers to the walls where the artists are painting in hopes of engaging passersby in discussions surrounding the project and sexual harassment. While painting the Sherif Street wall, the female artists switch between deflecting comments from curious passersby and being happy to engage with the public. Passersby ask questions like, “Who you? What are you doing? What organization do you represent?” or praise the work. One thing is certain — passersby are certainly intrigued. For Mansour, the project has made substantial steps forward since last year by partnering with established women’s initiatives and increasing the number of female artists, but she sees room for improvement. “There are very few female graffiti artists, so I really like the idea of all gathering for one project, it gives us more strength,” says Alexandrian calligraphist and street artist Khadiga al-Gawas, 21, waiting for the electricity to return. “I was never the most in tune with women’s issues and such, but when I heard of the project, I though I should do this for my mom,” Hany Khaled, 26, says. When asked about Falkholt’s input, many of the artists agree that her approach was interesting, but not necessarily a style they would use in future. Falkholt’s work is intricate, detailed, huge and sometimes controversial. She once painted a colorful abstract piece of a women’s legs and vaginal canal on a school wall in Sweden. It’s often difficult to judge if cross-cultural collaborations actually resonate with the participants. The WOW artists give mixed reviews. “We’re working with it as an exercise, but it’s her style — not ours. Each person should determine their own style, not just continue to appropriate hers,” says one artist, who trails off and disappears into the dark garage before I get her name. The Sherif Street wall was primed with Falkholt’s color-dusting technique: She first primes the wall by spraying negative words and phrases, then adds layers of phosphoric colors like patchwork. While my uncertainty about mobilizing artists remains, this event seemed to be an eye-opener for many people. The walls are engaging, while the process stimulates debate around socio-political art, collective work, and women in public space. The project will celebrate its end on February 15 at the Dahab Hostel, with live music from Rasha Magdy, Cherine Amr, Abdullah Miniawy and El Taree2a.